There's just something about a wrap dress. For many, it does wonders for the figure. It creates an hourglass shape, flatters the bust, and makes the most of curves. And many of them are made from wrinkle-resisting, stretchy, washable fabric. 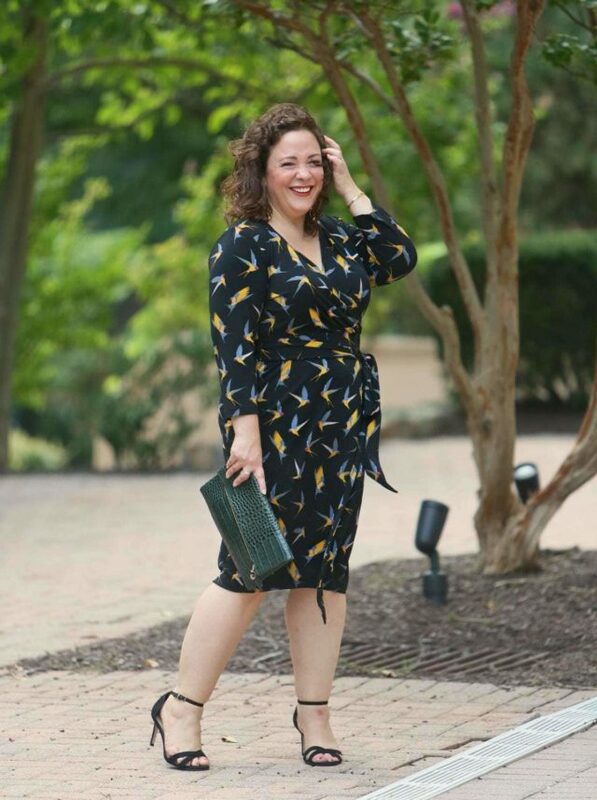 But not all wrap dresses are created equal. 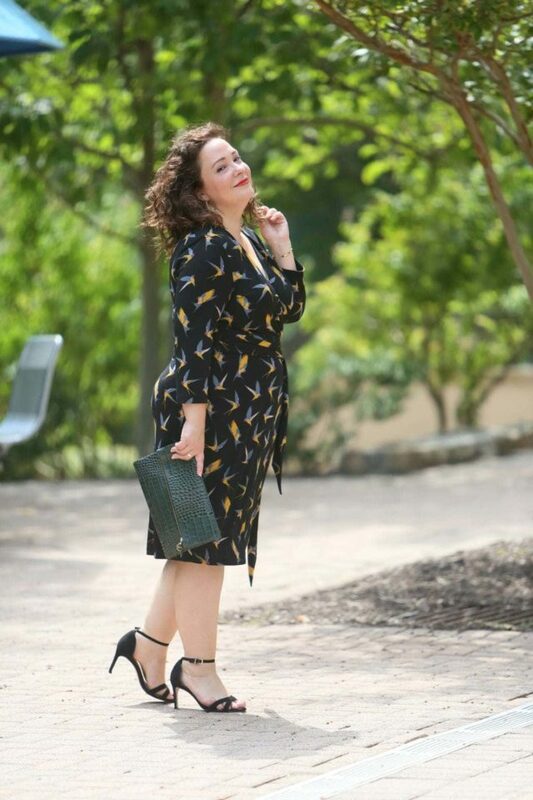 Some wrap dresses don't have enough fabric at the bust and require a cami to not get arrested. 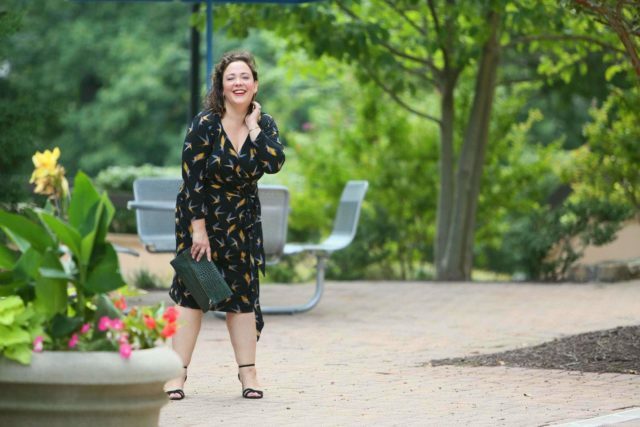 Many have sleeves too snug, too large a hole for the belt showing skin at the waist, or not enough fabric making it hard to sit or walk on a windy day without showing more than you want. So when you find one that has it all, it's pretty fantastic. This one came in a recent Gwynnie Bee box, and I wasn't expecting anything spectacular. I've been struggling with Gwynnie Bee the past few months. I have a different body shape and things are coming too small, too large, or a silhouette I used to be able to rely on but now looks utterly whack on me (yes I did get that pink dress but shocker, it too was a wrap dress). The other dress in the box was ridiculous on me so I put this one expecting to throw it too in the purple bag. But wait, it fits! And it looks good! No need for a cami or a strategically placed safety pin. And if you can't tell by my hair and that almost every photo is facing the same direction, this was an extremely windy day and I didn't flash a single person. This is the kind of dress that would work for the office, for a night on the town, for a social event like a wedding. It's all about how you accessorize it. For work, I'd style it with pumps or pointed toe flats. This look is more for a social occasion. I added a clutch to dress it up (and no your clutch doesn't have to be the same color of any part of your outfit, in fact not matching can be more stylish than perfect coordination) as well as some statement earrings with shine. Gwynnie Bee is a clothing rental program that offers looks from size 0-32. If you'd like to try Gwynnie Bee, use my link and get your first month for free. Do note this like most links on my site is an affiliate link and if you use it I may make a small commission. I giggled while reading this, as you first described a DVF a wrap dress I tried on at the consignment shop the other day: it did not have enough fabric in the bust area and the skirt area was also prone to exposure. Well, now that I think of it, maybe it was a size too small! 3 years ago I impulsively bought a Liz Clairborne wrap (faux wrap) dress online from Sears Canada. It was rather devastating when Sears closed down at the beginning of the year. However, I was delighted to find that JC Penney carries them in a wide variety of prints and both long sleeve and short. I justed received 2 new ones and love them. Highly recommend. Looks great! 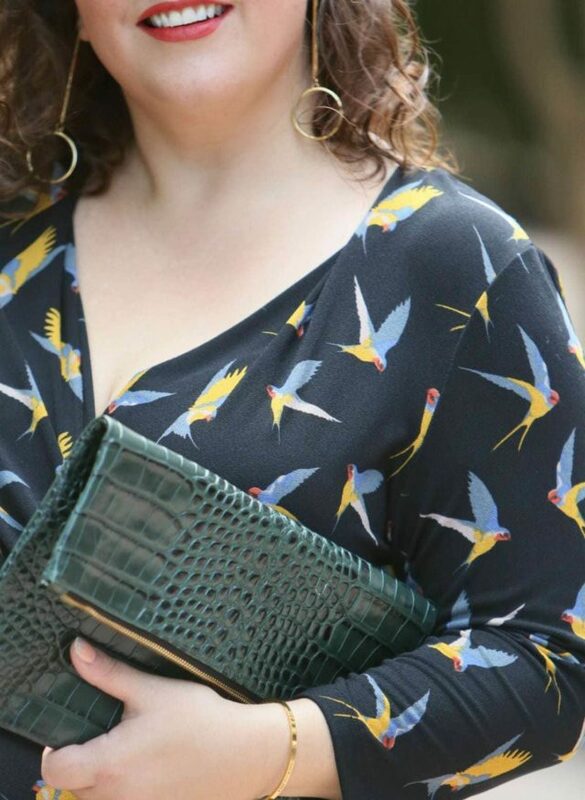 I have a shirt dress with a bird print from Eshakti that never fails to make me smile when I wear it. 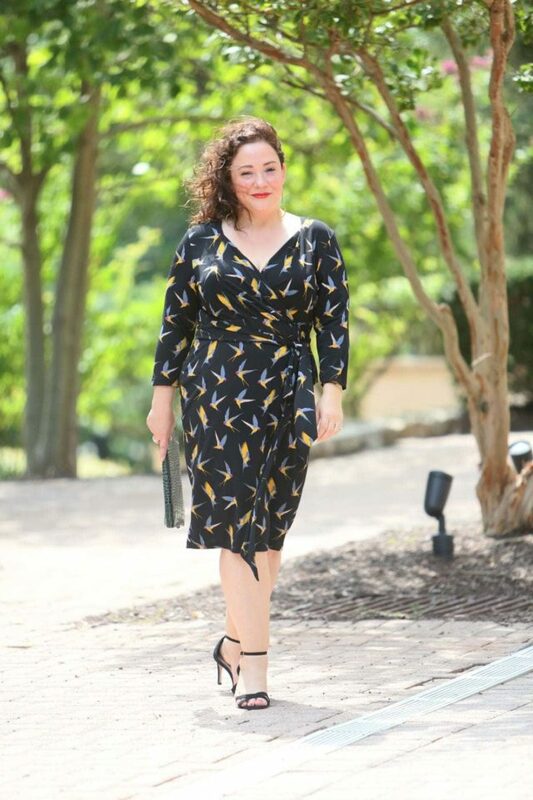 To me, bird print is!elegant and less precious than many florals. You ROCK that dress. What a beautiful bird print, so full of energy and swoopiness! The dress looks wonderful on you! The bird pictured is a barn swallow. One summer I rescued and released a barn swallow so that he could migrate with his group. What a sweet, friendly little bird and what a great experience! Yes. This one’s a keeper! So cute, the dress, your attitude in the photo shoot, the shoes, even your lip color! It all works, and it’s all good! Really cute! The cut suits you beautifully. I LOVE this. You look great. That dress indeed looks fabulous on you. 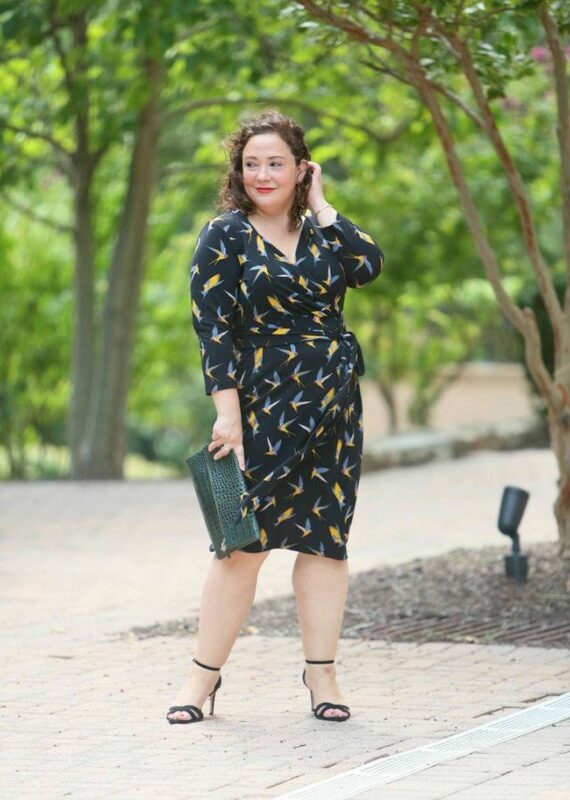 I love the bird print!